I post things on here about my parenting choices often-my breastfeeding journey, our decision to co-sleep, my decision to stay home with my daughter, and my decision to do Baby Led Weaning with her as well. I'm so grateful that I followed my daughter's cues for sleep. I think that ALL parents should co-sleep it's better than sleep training-which makes me a better mom. I'm so grateful that I get to spend my days with my daughter. If you're working, you are missing out on these moments. You should feel sad and regretful about all the things you're missing. I work because I want to set a good example for my children. Moms that stay home don't set good example for their children. And if I was feeling particularly sensitive I might take it even more personally. But I don't. Those things don't mean anything to me because I know I am making the right decisions for my family. But in the times that I second guess myself, I most definitely start fluttering. I don't post for working moms, or sleep training moms, or moms who formula feed. I post for moms. When I post about sleep I'm thinking about myself as a new mom when JaiseAnn was about six months old. I thought I was truly losing my mind as she woke several times an hour. All the books were telling me to "train" her but I just couldn't bring myself to do it. I think of all the blogs I so gratefully stumbled upon that gave me hope. Moms who had frequently waking babies just like mine who promised it gets better and that they outgrow it. Moms who told me I'd be happy I decided to stick with my gut. I am forever grateful to them. So when I'm having one of those grateful/hopeful moments, I might decide to share it--in the hopes that maybe a new mom might stumble upon it (or a not-so-new mom who needs reminding that it does get better). I post for the me I see in them. When I post about not working I think about the first time I said to Zach, "I can't leave her." I remember how much I felt in my heart I wanted to be home, but how terrified I was to have that conversation. I remember spending hours upon hours pouring over work from home websites and tips for living on a single budget family. I remember being scared to make the decision. Would she resent me because we wouldn't be able to give her as many things? Would I regret it? I remember calling up a few of the parents of my former students and asking, "Will I regret this?" Is it worth it?" and always closing with, "I'm so scared." I remember that time for me. It was a time of great uncertainty and big decisions hovering over one tiny little girl. I am forever grateful for the moms who told me, "Yes, it's worth it!" "I have never regretted it!" "It will be okay." I am grateful for every encouraging blog post and the reminders I still see that encourage me to continue making that decision a priority. I post for women in a similar situation. Women who might need to remember why they chose to stay home, or women who are trying to make that decision and are very scared/unsure. I post for the me I see in them. When I post about breastfeeding, or cloth diapering, baby led weaning, or anything else about parenting. I do it for a reason. I post for the parts of me as a mom that I see in others. I post for the moms. My posts aren't here to divide. They are here to encourage. I won't apologize for the gratitude that I feel and the love I've developed for being home with my daughter--and I won't censor that. I won't apologize for being able to breastfeed and loving the opportunities it has given me--and I won't censor that. I won't apologize for the decisions I've made and sharing the reasons or feelings behind them. I won't apologize because those came from a good place. They came from my heart, in the hopes of helping to encourage someone else. The mission of this blog is to uplift. I hope that all who come to pay me a visit here, know and recognize that. 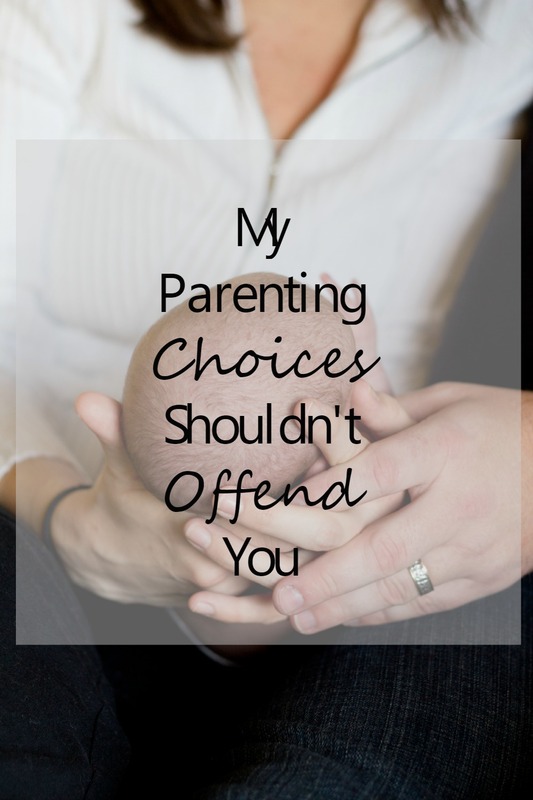 How do you feel when you see posts about parenting choices that differ from yours?